"this transaction is not safe on the phone"
Hello, I am Miss Young. I received this story from a friend. Let me call him Semper. harry2006burnham@yahoo.co.uk (Delivery officer), and yes, I spoke with him on the phone (I CALLED HIM) yet, to see if these terms are acceptable or not. I will enclose all the photos for you. Your web sight was a big help and an eye opener. The pictures I sent should be referenced as follows: box & boxes (I received first) / A1 RECEIPT (second) / shipment (third) / displomatic_passport1 (forth/last) . You can post them.......Thank you and God Bless! PS. 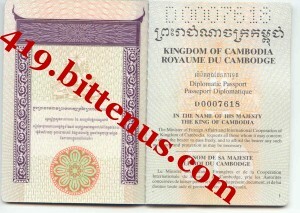 The title they gave (displomatic_passport1), they misspelled diplomatic, not me! Thank you for your quick response.There is no risk what so ever, as regards this money. But the most important thing is that I do not want this money to go through the bank around here, It will not be safe for us, I have a very good, trusted and reliable diplomatic courier contact used mostly by our forces in Kuwait, that can send goods easily through diplomatic and private military way, to anywhere in the world, without them being checked at any port of entry. They can deliver this money for you easily, to any address of your choice. The baggage will be tagged diplomatic documents, and the courier company, are not going to know the contents of the boxes. A few friends have used this means to convey goods, without being checked because of the diplomatic immunity they enjoy. Their charges are very high, but I will negotiate a way out from this end, till it gets to your door step anywhere, and I will follow up immediately and meet with you for disbursement after you have received it.If you feel it will not be safe in your place, we can have them ship it to London, then you can fly to London open an account and deposit the funds in this account. I am very sure you will know the best way to handle this money for us , that is why you will be in full charge. Please let me have an address where you want them to deliver the goods to. It could be a bank address or any address. As soon as I get it, I will start making arrangements as to sending the merchandise to you.I will send the total since I can not take any chances by keeping cash on me. Your percentage still stands at 50%,It is only us that knows about the transaction from this end. Please if you know that you are not capable of handling this huge sum, please don't allow me to send it,I can always find other means of dealing with this.You know that the security is very important, you can not trust anybody therefore note that this transaction is not safe on the phone, remember to keep secret.I cannot call you on the phone or receive fax.I hope you are ok with this? Everything must be done by email. Will you still help? So that we can proceed with the next step. I plan on sending the shipment tomorrow. In the mean time view the two pictures attached of the box this way you will know the size etc.I will need your phone number when sending the package. Please handle it, you know how Iraq is. Everyday bomb attacks and dead bodies. I am not allowed to carry cash here that is why i had everything sent in the box.Please dont allow us to loose the box. Whatever you spend, write it down. Once i come you will be paid back for the expenses. Delay is dangerous i dont want the box opened.If it gets opened how do we explain all that cash. Please take care of it. Once you have it send me an email.If you know you are not capable why did you allow me to send the box? We confirmed your identity and you are to send the 1,000.00 Euro for the diplomatic Immunity.Since you are not a diplomat we will be getting immunity from our consulate office here in London. should i send you the wire details? Or you would prefer to send the money by moneygram money transfer? A wire transfer can take 3-4 working days for us to confirm it. But moneygram can be received the same day. The delivery date will be monday once you send the funds. Please make sure you are at home to sign, your shipment will not be released to anybody else. If you have any questions please feel free to call or send us email. I am the delivery officer handling your shipment. I am taking the picture now of the shipment and i will send it. I will use my camera phone. anytime it is my direct telephone number. when calling from America add 011 before you dial. So dial 011447788814091. I am harry. nothing to fear. I give you a personal guarantee. immunity they wont allow me to pass with the shipment. I am sorry but that is the honest Truth. The shipment. This is the picture. Call me if you have any more questions. Sorry i am very busy at the airport with other shipments.concerning the email you sent. contact your consulate they will recommend a shipping company to you. giving the courier company authority to deliver your shipment. This is what you are paying for. Please understand. The money you will send it to Mr. Alex Semper. in your surname. Do you understand now? I trust you, i have called you. Took your pictures and answered your questions. We are paying a diplomat and not me. It is not free. on monday afternoon by 3pm your time. western union details, like name and address of the sender. we have no choice. I hope you understand now? passport so that you will know what he did for you. to people. Are you 100% sure that i will run off with your money? Just because we are not DHL or FEDEX does not mean your shipment wont be delivered. Your friend could have used DHL or FEDEX why did he choose us? Why do diplomats and consulates choose us to deliver their confidential shipments? Think about it. and then when she sends you the second page. Send the balance. what do you think? the diplomat and speak to her for about 30 minutes. I told her you are afraid for your money. passport for you. I dont see what else you want me to do. The diplomat wants the money sent by western union. The escrow account thing will not work. not your problem but to trust is the problem. back to kuwait since it has no immunity.so i guess today is the final day for you to send the money. I am not working today, we dont work on weekends. So you can reach me on my phone anytime. So go and send the funds and call me so that it can be done today. stay at the airport any longer. I am sorry. But i told you about the immunity, how do you think the shipment will come through the US customs? If they see cash from Iraq they will inform the IRS and homeland security.Then how do you explain it? Are you a businessman from Iraq?You trust someone with your life, but i trust you with the shipment.I know what i sent you and believe me it is not antiques. Look at the attached picture again. You will see the contents clearly. I used that courier company because they are very confidential. They are not even registered online so there is no trace back to us. I had to cover our tracks. It is a lot of money. I still dont know why you have delayed so long? Dont you want the money? Should i get someone else to receive it? I can apply for change of receiver because it seems you dont want us to be partners again? My own fear is that how will you hide the money? Because it is a lot of money. so let me know are you with me or not? You are complaining about $1,356.00 dollars do you know how much i paid for shipping? Did i ask you for it? Once you send the money, let me know and once the immunity is issued let me know. When is the delivery date and time? Do you know where you are keeping the shipment once it arrives? Plan all this it is very important. Whatever you do make sure you stick to the same story that it is antiques. Because once it is opened by customs all Hell will break loose. Scam letters about money found in Iraq are quite common. You should also read the Patricia Lamotte story.